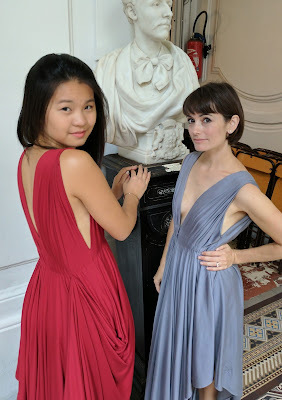 Nicole at Home: A month in Paris: the couture dress! 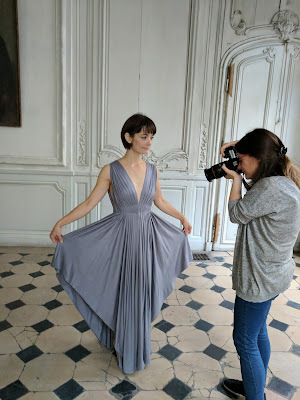 A month in Paris: the couture dress! Today marks exactly two months since I arrived in Paris and one month since I departed. 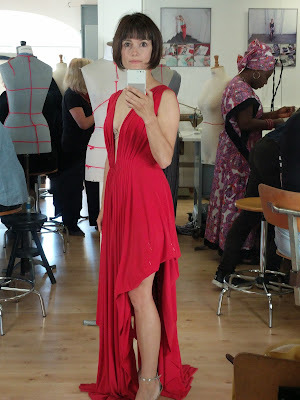 I guess it's about time I wrote about the dress! 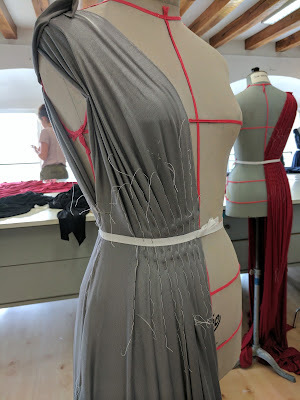 The primary objective of this couture techniques workshop was to sew a custom-fit dress in the style of Madame Grès. 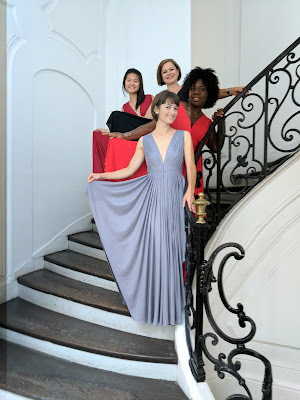 Our dresses were based on one of her designs from the 60s, with some slight variation (the original had an exposed zipper in the front--eek!). 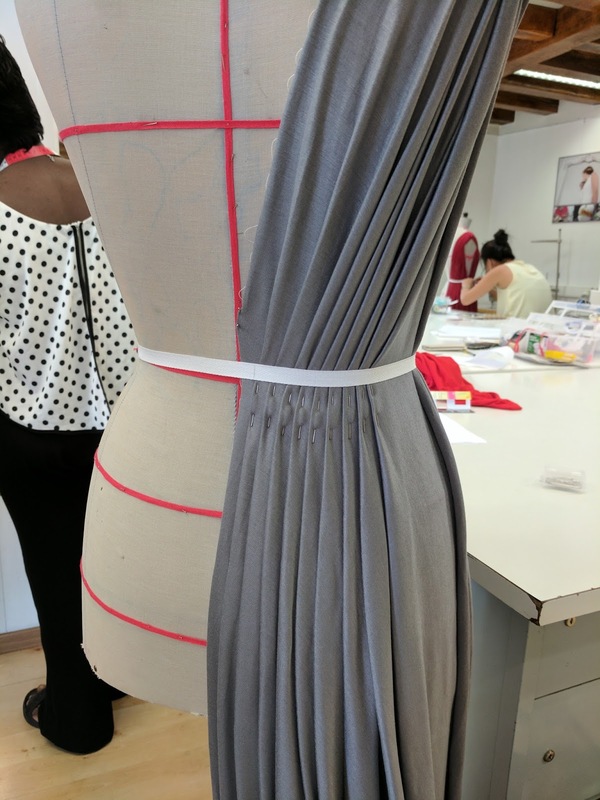 Madame Grès is best known for her finely pleated creations, so our version is a "starter" Grès, with a mere 20 pleats! 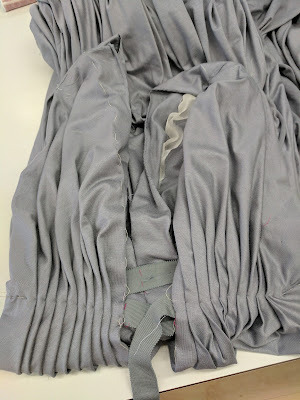 The fabrication for our dresses was supposed to be viscose jersey, but I made a poor choice and brought modal jersey. It was a bit too stretchy and much more annoying than the viscose, and mine happened to stain with water, so it was all around a royal pain. The dress started with 7 yards of fabric, cut into 4 equal lengths and we draped the garments such that the straight grain was along the center front and back. The only critical measurement was the waist and that was defined by the "bolduc" (twill tape). 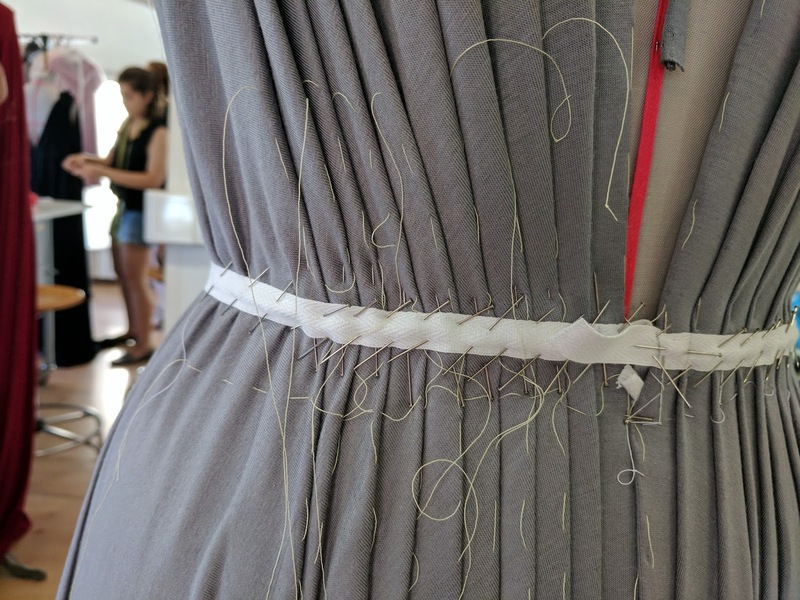 Nearly all markings were done with hand-stitching, so we "passed a thread" to mark the edges of our dress, shoulder points, and eventually all the pleating. 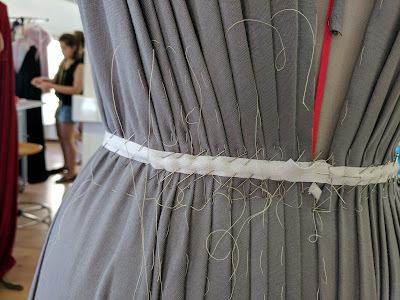 Here's my work after a few days, on the dress form, with the pleats placed and marked with thread. After defining the pleat positions on the front and back sides, the markings were then transferred via pins, then chalk, and finally thread to the second half of the dress. 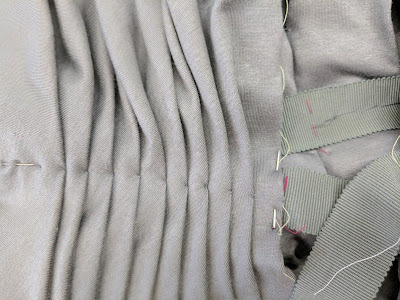 Pleats were then repositioned, sewn with tiny stitches, and eventually attached to grosgrain ribbon on the inside. And then sewn to the grosgrain by sewing over the pleat stitches. The front and back necklines (and shoulder seams) are strengthened by strips of silk organza, attached with tiny stitches along the neckline edges. You can see a bit of that in the image below, with the silk organza in cream. The second picture shows the nearly invisible stitches along the neckline edge. A separate underlap was sewn in (by hand, of course) for snaps and some critical hook and eyes to keep the whole thing closed. The upper line of tiny stitches along the waistline is secured with satin ribbon in the same was as the grosgrain. The neckline edges were overcast by hand (no sergers here!). 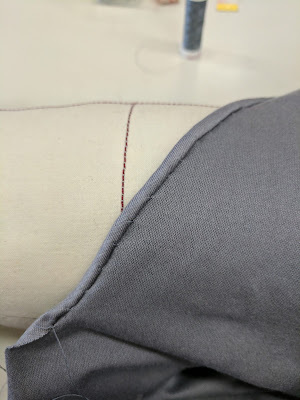 We did use the straight stitch machine for doing the final line of stitching at the center front/ back, side seams, and shoulder seams but only after "passing the thread" on both sides and basting with contrasting thread! Here's the dress before cutting for the hem. I kind of loved the pooling effect, but it was certainly not practical (whatever that means when you're making a couture dress). 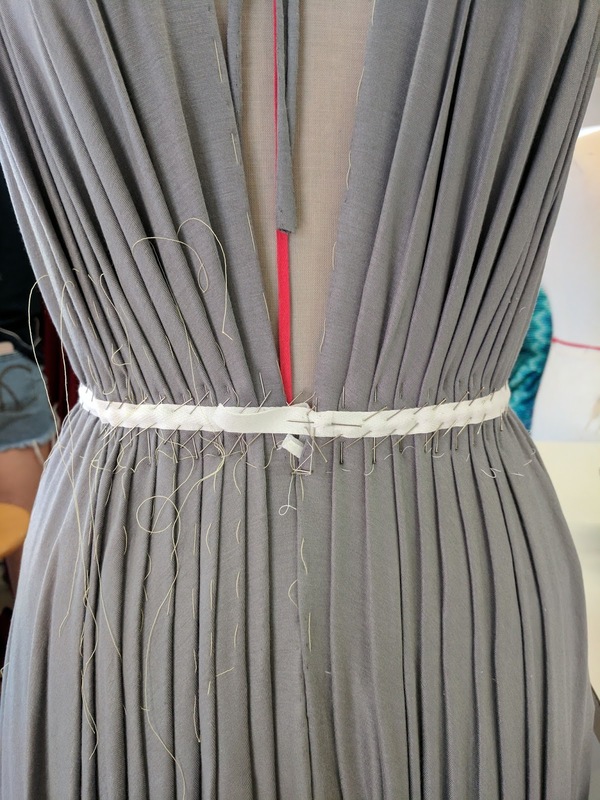 We had an initial fitting with the instructor--the shoulders had to be adjusted and the waist is quite loose. I had lost some weight over the month, so the waistline *should* have been adjusted by about 1.5" but I chose to leave it; I couldn't face whatever ridiculous alterations were necessary with only a few days left! At the second fitting, we determined the hem length. 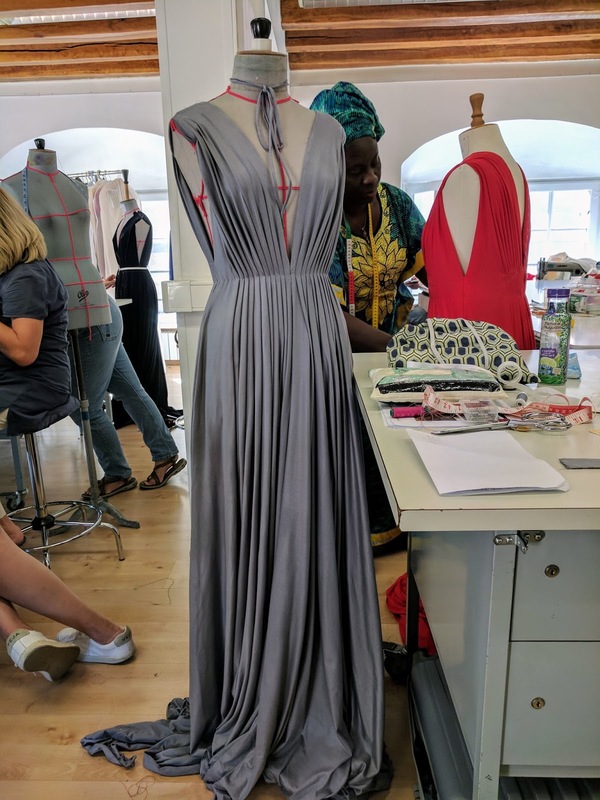 There was considerable discussion among the instructors about how high the side hem should go and here I am in the "model" dress to check the side length. The instructors wanted it this high! I went with something a bit more conservative (whatever that means when your dress has this deep of a vee in the front, back, and sides!). 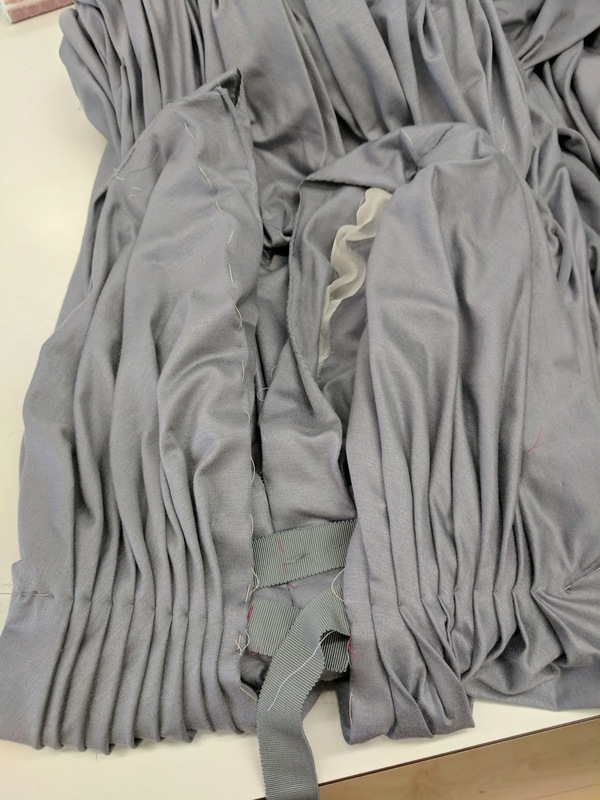 In the image below, the front hem hasn't been trimmed yet, but the sides are cut. 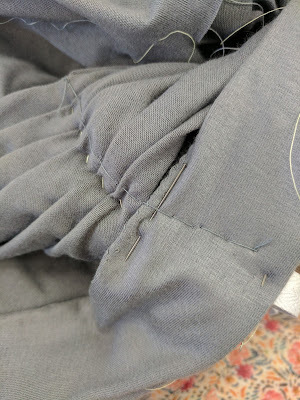 Once cut, I spent over 6 hours hand-rolling the hem! In all, I spent about 50 hours on this dress. It's not perfect (the side seams roll like the devil and the waist is still too big! ), but I'm proud and pleased with this dress! Here are some lovely photos of some of my colleagues and I in our final product. 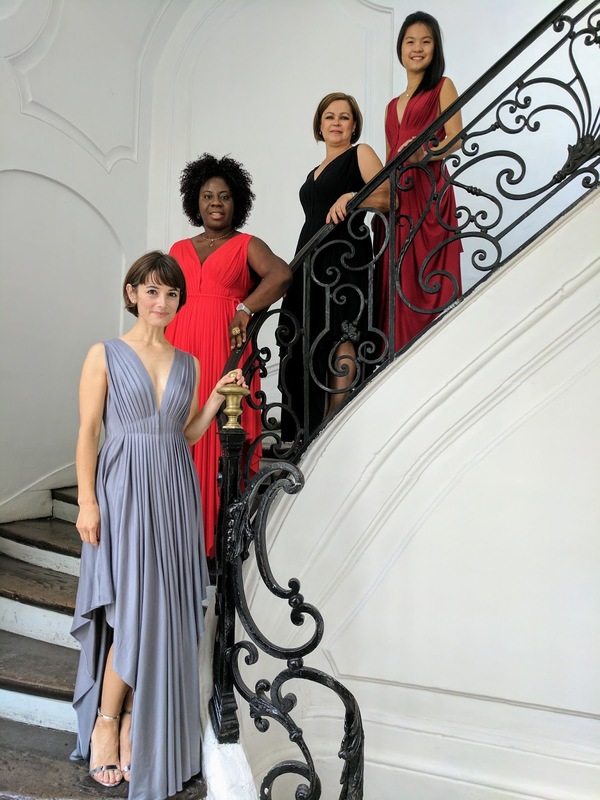 This style was universally flattering and all of the dresses turned out stunning. 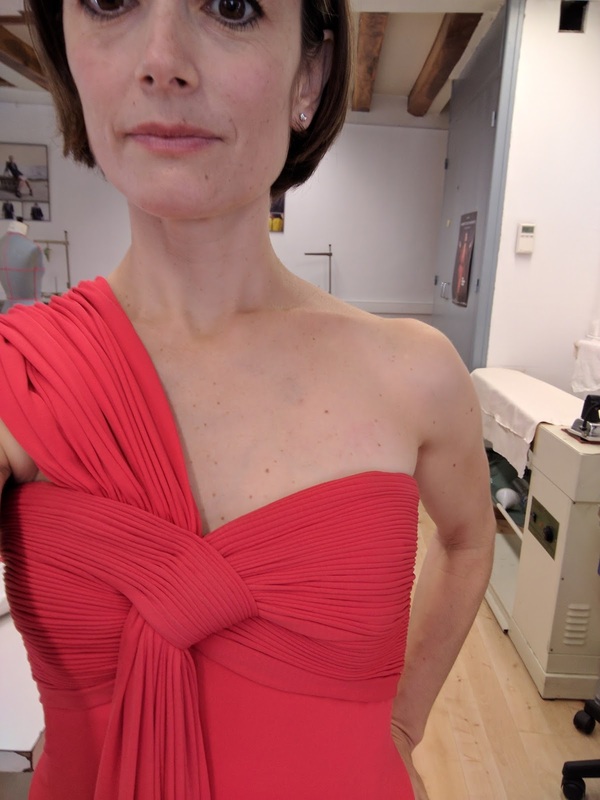 Finally, I was lucky enough to be able to try on (and fit!) 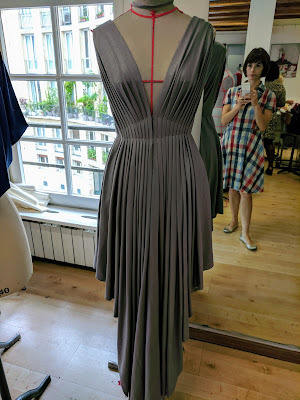 a real Madame Grès dress that I had been oogling the entire month. Here I am in that dress (made of the finest silk jersey) with my amazing instructor Madame Martine. Seriously, look at the pleating of a true Grès dress! Truly words cannot adequately describe my experience in Paris. It was hard work and not always fun (I cried in class one day! ), but I was humbled by the immense knowledge of all of my instructors and to say I learned a lot would be a tragic understatement. Ah, Paris. what an amazing experience!!!! 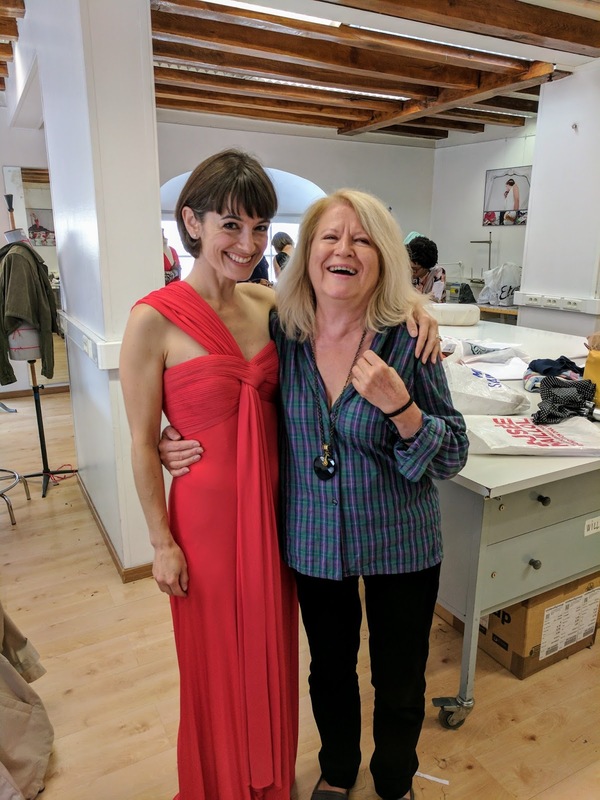 Your Dress is beautiful, thank you for sharing! The dress and photos are positively beautiful! 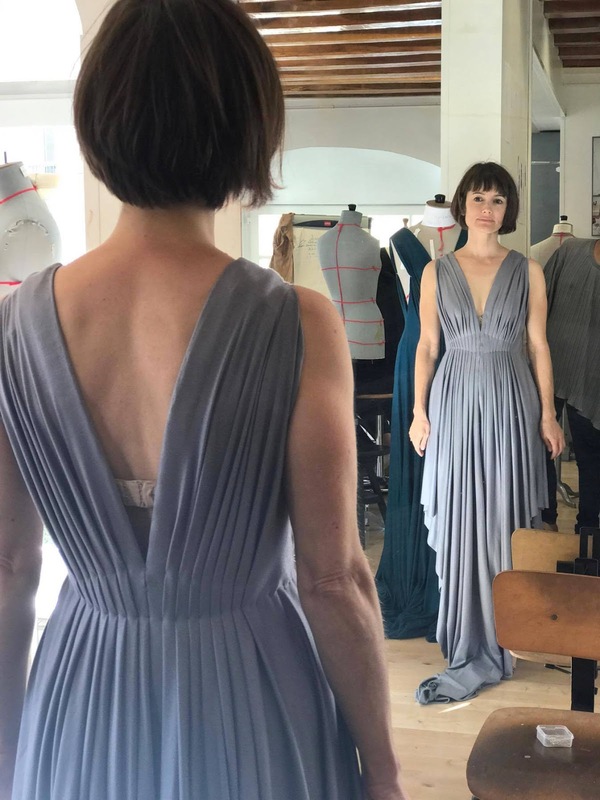 I'm in awe of the time and attention to detail this dress required. Thank you for sharing your Parisian experience and gorgeous makes with us! Extraordinarily beautiful! You should be so proud! Thank you for so many details. Gorgeous!!! You look like a Greek goddess sitting in that dress! Wow Nicole, love it! All I did in Paris this summer was eat baguette and stare at the Eiffel tower! Stunning and what an amazing amount of work. 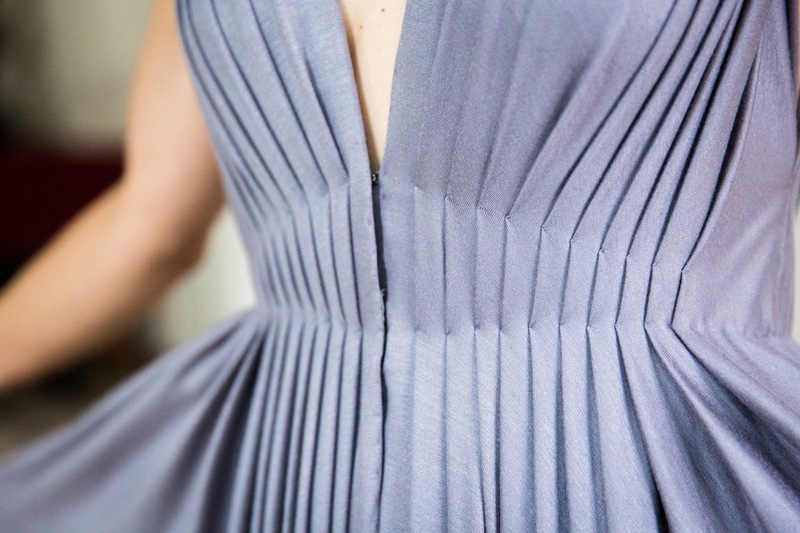 Couture sewing is all about hand sewing and those pleats are drool worthy. Gorgeous!!! And only you would notice your fitting imperfections because i thought it looked great!!!!!!! Beautiful! Wow. There are no words to say how beautiful this all is. I can appreciate the demanding rigours and how emotionally exhausting such a course must have been but oh, those photos of you. Soooo stunning. Oh, and your fabric is THE best colour. It is a beautiful and beautifully made dress. I don't even know what to say about this! What an amazing experience for you! Your dress is absolutely beautiful. Wow, that dress is gorgeous and you look amazing, like a fairy queen! You are right to be proud! It's so impressive.